Unless the 911 Assist setting is set on prior to a crash, the system will not dial for help which could delay response time, potentially increasing the risk of serious injury or death after a crash. : Do not wait for 911 Assist to make an emergency call if you can do it yourself. Dial emergency services immediately to avoid delayed response time which could increase the risk of serious injury or death after a crash. If you do not hear 911 Assist within five seconds of the crash, the system or phone may be damaged or non-functional. Always place your phone in a secure location in the vehicle so it does not become a projectile or get damaged in a crash. Failure to do so may cause serious injury to someone or damage the phone which could prevent 911 Assist from working properly. SYNC 911 Assist feature must be set on prior to the incident. Before setting this feature on, ensure that you read the 911 Assist privacy notice later in this section for important information. If 911 Assist is turned on or off by any user, that setting applies for all paired phones. If 911 Assist is turned off, a voice message plays and/or a display message/icon comes on when the vehicle is started after a previously paired phone connects. Every phone operates differently. While SYNC 911 Assist works with most cellular phones, some may have trouble using this feature. If a crash deploys an airbag (excludes knee airbags and rear inflatable safety belts [if equipped]) or activates the fuel pump shut-off, your SYNC equipped vehicle may be able to contact emergency services by dialing 911 through a paired and connected Bluetooth-enabled phone. For more information about 911 Assist, visit www.SYNCMyRide.com, www.SYNCMyRide.ca or www.syncmaroute.ca. • For information on airbag deployment, see the Supplementary Restraints System chapter. • For information on the fuel pump shut-off, see the Roadside Emergencies chapter. Perform the following: 1. Press the phone button to enter the Phone Menu. 2. Scroll until 911 Assist is selected. 3. Press OK to confirm and enter the 911 Assist menu. 4. Scroll to select between On and Off selections. 5. Press OK when the desired option appears in the radio display. Set On or Set Off appears in the display as confirmation. Off selections include: Off with reminder and Off without reminder. Off with reminder provides a display and voice reminder at phone connection at vehicle start. Off without reminder provides a display reminder only without a voice reminder at phone connection. To make sure that 911 Assist works properly: • SYNC must be powered and working properly at the time of the incident and throughout feature activation and use. • SYNC 911 Assist feature must be set on prior to the incident. • A Bluetooth-enabled and compatible phone has to be paired and connected to SYNC. • A connected Bluetooth-enabled phone must have the ability to make and maintain an outgoing call at the time of the incident. • A connected Bluetooth-enabled phone must have adequate network coverage, battery power and signal strength. • The vehicle must have battery power and be located in the United States, Canada or in a territory in which 911 is the emergency number. Not all crashes deploy an airbag or activate the fuel pump shut-off (which would activate 911 Assist); however, if 911 Assist is triggered, SYNC tries to contact emergency services. If a connected phone is damaged or loses connection to SYNC, SYNC searches for, and tries to connect to, any available previously paired phone and tries to make the call to 911. Before making the call: • SYNC provides a short window of time (about 10 seconds) to cancel the call. Failure to cancel the call results in SYNC attempting to dial 911. • SYNC says the following, or a similar message: “SYNC will attempt to call 911, to cancel the call, press Cancel on your screen or press and hold the phone button on your steering wheel.” If the call is not cancelled and a successful call is made, a pre-recorded message is played for the 911 operator, then the occupant(s) in the vehicle is able to talk with the operator. Be prepared to provide your name, phone number and location immediately, because not all 911 systems are capable of receiving this information electronically. • Your cellular phone or 911 Assist hardware was damaged in a crash. • The vehicle’s battery or SYNC system has no power. • The phone(s) paired and connected to the system was thrown from the vehicle. Once 911 Assist is set on, it may disclose to emergency services that the vehicle has been in a crash involving the deployment of an airbag or activation of the fuel pump shut-off. Certain versions or updates to 911 Assist may also be capable of electronically or verbally disclosing to 911 operators the vehicle location, and/or other details about the vehicle or crash to assist 911 operators to provide the most appropriate emergency services. If you do not want to disclose this information, do not turn the feature on. Always follow scheduled maintenance instructions, regularly inspect your vehicle, and seek repair for any damage or problem you suspect. Vehicle Health Report supplements, but cannot replace normal maintenance and vehicle inspection. Vehicle Health Report only monitors certain systems that are electronically monitored by the vehicle and will not monitor or report the status of any other system, (i.e., brake lining wear). Failure to perform scheduled maintenance and regularly inspect your vehicle may result in vehicle damage and serious injury. Note: Your Vehicle Health Report feature requires activation prior to use. Visit www.SYNCMyRide.com to register. There is no fee or subscription associated with Vehicle Health Report, but you must register to use this feature. Note: This feature may not function properly if you have enabled caller ID blocking on your mobile phone. Before running a report, review the Vehicle Health Report privacy notice. Note: In order to allow a break-in period for your vehicle, you may not be able to create a Vehicle Health Report until your vehicle odometer has reached 200 miles. 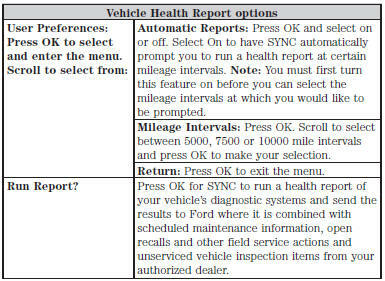 Register for Vehicle Health Report and set your report preferences at www.SYNCMyRide.com. After registering, you can request a Vehicle Health Report (inside your vehicle). Return to your account at www.SYNCMyRide.com to view your report. You can also choose for SYNC to automatically remind you to run reports at specific mileage intervals. Cellular phone airtime usage may apply when reporting. • Unserviced items from vehicle inspections by your authorized dealer. You can run a report (after the vehicle has been running a minimum of 60 seconds) by pressing the voice button and saying “Vehicle health report”, or pressing the phone button. To run a report using the phone button: 1. Press the phone button to enter Phone Menu. 2. Scroll until Vehicle Health is selected and press OK.